"I welcome the monstrous Democratic slap the Greek people has given to the European Union," Le Pen told France’s RTL radio. The Greek election debate is one of freedom, she believes. 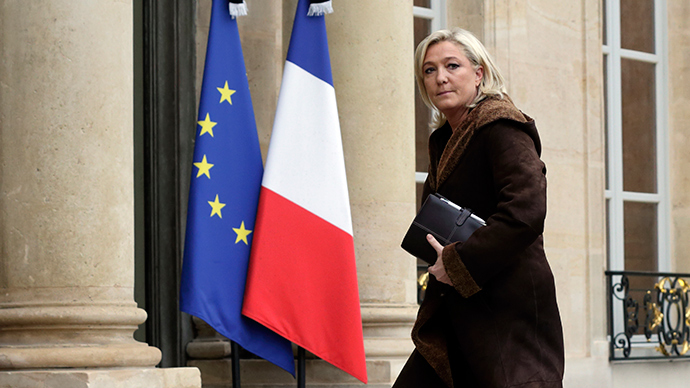 Sunday’s elections in Greece are “opening the trial of the 'euro-austerity’,” according to Le Pen. "When we try to avoid democracy, the boomerang always returns with increased speed." "There is a fracturing in Europe, which is seeing the people taking power against the totalitarianism of the European Union and their accomplices, the financial markets,"she added. Syriza’s win was welcomed by France’s Socialist party, several MPs from which protested France’s President Francois Hollande anti-austerity policies last year. "The victory of a party on the left is always good news for the Socialist party in France," said First Secretary Jean-Christophe Cambadélis. Jean-Luc Melenchon, France's most prominent far-left politician described Syriza’s success as "pure happiness." "This is a new page for Europe. Maybe we can take the opportunity to rebuild Europe, which has become the federal Europe of the liberals,” Mélenchon told France’s BFM TV. On Sunday, Syriza won 149 seats in the 300-seat Greek parliamentary election. Party leader Alexis Tsipras said Greece leaves behind five years of humiliation and suffering, fear and authoritarianism while addressing thousands of cheering supporters at a rally in Athens. Tsipras is moving to build a stable government and plans to get rid of Athens’ three main creditors – the European Union, the International Monetary Fund and the European Central Bank.